When I think of badging and achievements in social media apps, I view them as a way to get people to stay engaged. Getting someone engaged has many benefits for those apps that are out in the internet, but in almost all cases the badging is there to help drive revenue. I view badging in a similar manner. Badging is a way to keep employees engaged in a platform or system that has been implemented. But the bottom line is not to drive direct revenue out of the employee but rather to keep employees engaged to drive some sort of business value. Recently I had debate about how badging in the enterprise can work in the most effective manner. The discussion centered around two types of badges. For this post, I am going to refer to each type of badge as 1) direct badge and 2) indirect badge. 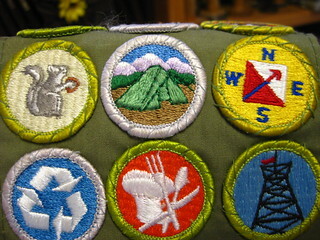 In direct badging, the badge is awarded based on a direct action taken by the person. For example, a teacher gives a student extra credit for doing extra work or completing an assignment early. In indirect badging the person is rewarded with a badge based on the action of a second person. For example, a teacher provides extra credit to a student because he received "kudos" from others in the school on the work she did, or how she acted in a specfic situation. The debate centered around which was more important. As I reflect back on the conversation, I realize now that both are very powerful for two very different reasons. Direct badging provides that direct reward for an action - aka. immediate satisfaction. This is a great way of getting people to stay engaged on your platform. It keeps people coming back for the next badge and trying to get to the next level. But when direct badging is not done well, the badges can be easily gamed. Having a badge "gamed" is not good. How many times have you been part of a project where metrics are gathered. As part of the project, the team starts gathering metrics and set some goals based on these metrics. After a while you find that the goal is being gamed and someone is cheating to make sure they always win. For example, suppose that there is a system at work that has a wide range of workflows/tasks that need to be completed each day. Some of the tasks available every day are easy and others are rather hard to complete. Now suppose that you set a goal that indicated that you would be "successful" if you completed 20 tasks. As it doesn't matter which task you do first, what do you think would happen? If you wanted to game the system, you would come into work early and try to meet the success criteria by doing the 20 easiest tasks. How is this type of activity helping the company or the individual? And if there are people gaming the system, are they creating any quality content or providing value at all? So what happens if you do not provide a reward based on the persons direct action but rather reward the person based on the value that they provide? Wouldn't that be much better for the company and help stretch that person into doing a better job. This is where indirect badging can provide additional value over the direct badging solution seen very often in systems. Indirect bading provides people a badge because someone found value in what they had to say. For example, Jill writes 15 blog posts. We give her a badge for writing the blog. But do we know that the blog posts provided any value? What happens if Jill is not really providing any value, but rather just blogging a couple of haikus or other non-business value added blog posts. How does badging provide any business value? It doesn't. but if we were to provide a badge to Jill when 20 people visited her blog post or 5 people liked her blog post, or 10 people commented on her blog posts, I hypothesis that by giving Jill a badge when people believe that the content is worthy of reading, liking, or commenting that you drive a different type of engagement. Jill will be much more interested in writing blog posts that provide value to others in the company. While this reward based on an indirect action is better, it still is not perfect. Jill might have friends and ask them to visit her blog posts, like her blog posts, and comment on her blog posts. That is always possible. But if you have a blog post that gets 1000 unique user views, I would venture to guess that Jill was providing value and not gaming the system. In addition, you could combine several indirect metrics for a new badge. For example, 15 unique views, 5 likes, and 2 comments gets you the Value Added Level 1 badge. Badging is not as simple as capturing the metric directly, but rather should be done with thought and analyzed to think how someone might decide to game the system. Combining both direct badging and indirect badging will help drive engagement beyond just engagement created by direct badging. Have you seen badging done poorly? What have you learned from the bad badging and how have you changed things to make it better?